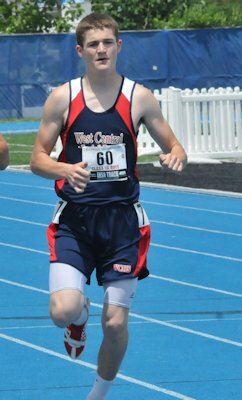 Zach Vancil Competes At State Track Meet for W.C.
Zach Vancil got his first taste of high school state track competition this past week as he competed in the IHSA State Track Meet held in Charleston, home of Eastern Illinois University. Last year, Zach as an 8th grader, received his first place State Championship medal in the 400 meter dash, setting a new school record in the Middle School. This year, Zach was the lone West Central qualifier from the Farmington Sectional Meet held last week. Vancil captured a sectional title in the 400, running a 51.23. Vancil, a freshman, was ranked 15th coming to the meet, and faced a field of 33 competitors. Although he ran a great race with hot and humid conditions, he posted a 52.85 which was not enough to return for finals on Saturday. He undoubtedly will return with a vengeance as a sophomore to the state venue.